The world’s stained glass is aging and as it reaches the 100-year mark it is in rapid decline. 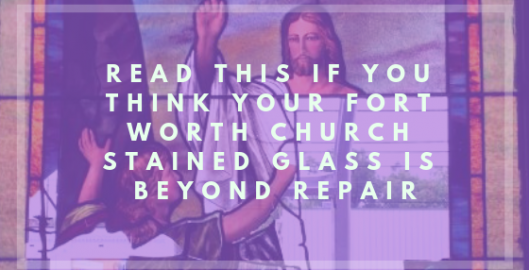 This is why stained glass window restoration is a popular and necessary task for churches in the Fort Worth area to undertake. If there is any hope of preserving these stunning pieces of history for the next generation–it simply must be done and all of Texas will be better for it as these are rich parts of our state’s history. Congratulations on your decision to get have the stained glass in your home restored! Soon you will see new life and luster in your glass and your home decor. Now that is done the next steps will be the restoration itself and like any job involving renovations and/or a contractor coming into your home, there are some things you can do to prepare your Fort Worth home. Below we have outlined a few suggestions for your preparations based on questions we get and advice we give to our customers about getting ready for a home improvement project. One thing we are often asked is whether the homeowner should stay or leave during a restoration. For the most part, we suggest you stay. While stained glass restoration involves “deep cleaning” and even some scrapping–most of the chemicals are rather gentle and non-toxic for homes, pets, and humans. In the cases when more in-depth repair work needs to be done or one that uses harsh chemicals, we will most likely be doing that part in our studio. Since stained glass is breakable (not any more than normal glass) it still always runs the risk of glass pieces where they shouldn’t be or breakage. 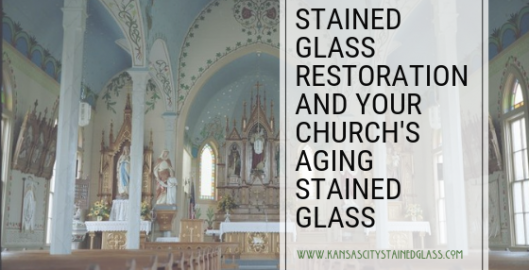 For this reason, will want the area to be completely clear so your stained glass restoration specialist is able to easily maneuver and safe. Also, take the time to clear off all ledges, shelves and, especially stairs–as these are areas that will be more useful empty. Make sure you take a good look around before the work begins and move what you can out of the way, more to the point–cover anything you cannot move. 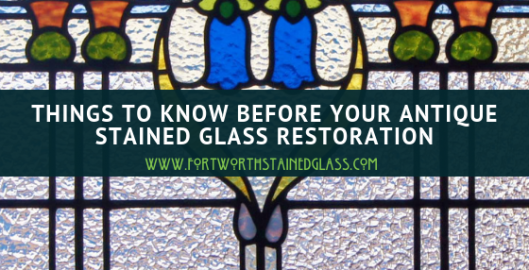 Although most of the cleaners we use when restoring home stained glass are fairly mild–water stains could happen if things aren’t covered. For sure, keep kids and pets away from the work area–even gating them in separate rooms. Things like ladders, buckets, dirty rags, and even loose glass are all items that could be laying around and be dangerous for children and animals–even adults too! Probably the best piece of advice we can give you is–if you have any question on stained glass restoration and/or crews, make sure to ask. Any reputable stained glass restorer should be able to tell you all you need to know and be happy to do so. 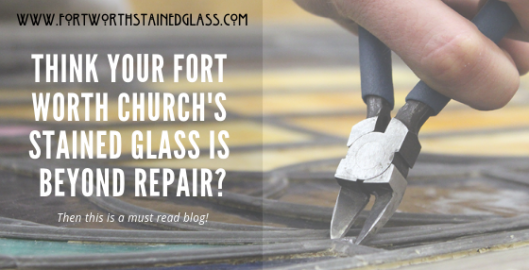 At Fort Worth Stained Glass, we are happy to answer any questions before, during and even after we restore your Fort Worth home’s stained glass. Contact us today for more information on stained glass restoration! Having an outdoor wedding in Fort Worth can really become the wedding of your dreams! With gorgeous open space and unbeatable views, Fort Worth is always a great location for a wedding. For those planning an outdoor wedding, don’t be underestimated in the amount of work that can be cut out for you. Outdoor weddings may seem lower key than weddings held in venues, but finding the right decorations and backdrop can take your outdoor wedding to an entirely different level. 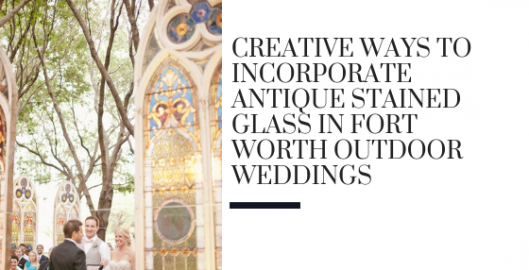 Antique stained glass can add a beautiful, traditional, artistic touch to any Fort Worth outdoor wedding. You final bought that gorgeous stained glass window you have been thinking about for your Fort Worth home! Congratulations! Our craftsmen are likely piecing it together right now and we are sure you are incredibly excited to have it installed. That is exactly the mood we want you to in here Fort Worth Stained Glass. 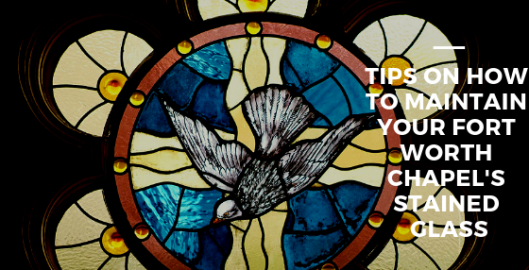 To make it that much more of a joyful experience, we have created a list of dos and don’ts that will actually make your stained glass experience even more fun and favorable. With a little bit of assistance from your household, we will make your stained glass installation as perfect as the window we are creating for you. DO: Prepare The Area. For the most part, our stained glass installations are simple and quick. However, it is a process that could involve dust, scraps, and/or chemicals so it is best if you take measures to protect your furnishings, walls, carpets. We suggest covering them in plastic. Give us a call if you have any doubt about this because smaller jobs may differ. You should remove valuables too–our installers are top notch but it is a good practice to be in when inviting in any contractor into your home. 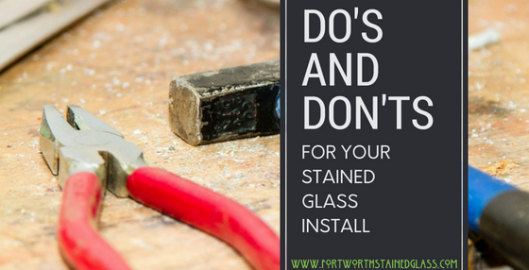 DON’T: Don’t try to help your stained glass installer. Things like lifting the window, touching the tools or interacting with any chemicals are bad ideas. This is definitely a precautionary measure to prevent you from getting hurt but also a way to keep you from being inconvenienced. Just relax and allow the company you paid to do the work. Remember– their labor is written into our stained glass pricing. DO: Stick Around. Most of our stained glass window installations are done in as little as one day. But some can take longer depending on the size and scope of your job. Your consultant will tell you exactly how long your job will take ahead of time though. Even if it is an extended project, you will be able to be in your home while it is ongoing. DON’T: Let pets or children near the job site. Not only can they be a huge distraction during install but the area is not safe for them to be in–at all. In the long run, keep Fido and Jr behind a gate–it is best for your kids, your pet and the installer. DO: Contact us with any questions or concerns. The stained glass window you bought for your Fort Worth home is something you have worked hard to get and paid good money for. Don’t hesitate to reach out to us for any purpose throughout the entire process. We are always happy to answer your questions and have a lot experience to pull from to do so. We want the whole process, including the installation to be an exciting and positive experience. Contact us any time; we would love to chat! Fort Worth Stained Glass is proud to be the trusted custom stained glass studio specializing in commercial hotel designs. We’ve completed numerous custom stained glass projects for hotels throughout the Fort Worth area. Stained glass presents a wonderful opportunity for hotels to promote brand visibility, attract new guests, retain repeat customers, individualize their decor, and much more. 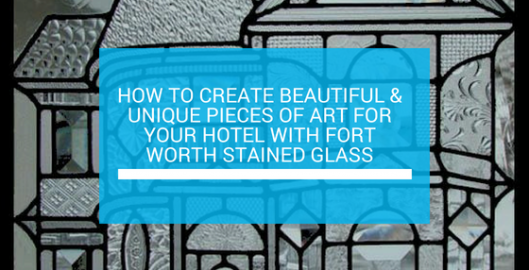 Make sure your hotel stands out by installing custom stained glass features. Most people have heard of the Mackintosh style even if they haven’t studied any sort of art history or design. This style was named after Charles Rennie Mackintosh and is characterized by his signature minimalistic style. He was a prolific designer, artist, architect and furniture builder who attended the Glasgow School, through his life and work he became one of the most influential figures in stained glass art of his time and even in present day. Among his many accolades, he had a succinct style of furniture that set him apart from other designers of his day and a still popular signature stained glass style, which includes the Mackintosh rose. No one can say for sure where Mackintosh’s style came from but we do know that the 1890s were a decade of great learning and artistic expansion for him. Around this time he traveled to Italy and decided to continue his design education. While his style is very different than Italian works of the time, his attention to color and romantic Italian themes, like floral patterns in his work, show the impact this trip had on his work. However, one would characterize his work as that of progressively modern for his time and even still today. He was an incredibly influential designer and some people call him the founder of the popular Art Nouveau still we see on buildings and in art today. The most commonly known and often imitated motifs by Charles Rennie Mackintosh are his signature roses. They are minimal but not less beautiful for it. Their wonderful natural curves and rich textures set them apart from other floral designs, as well as his use of bold colors against clear glass. They are definitely one of the world’s most gorgeous and recognized stained glass motifs and a picture of doing more with less. While no studio today can claim to live up to Mackintosh’s signature style, we at Stained Glass Fort Worth, offer marvelous stained glass windows in the style of Charles Mackintosh which are on par with his original designs. Our work will leave you with a sense of vintage nostalgia, and will truly bring his style of work to life in your home. Mackintosh’s designs are easy as relevant today as they were at the turn of the 20th century and beyond and will look amazing on any home old or new. 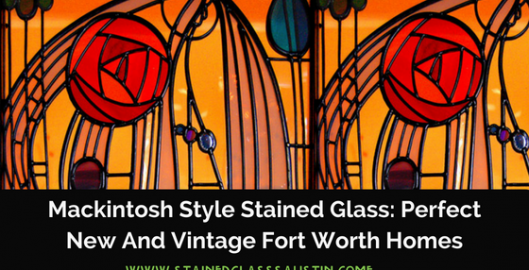 Contact us today to learn more about Mackintosh style glass to beautify your Fort Worth home. Fort Worth Stained Glass is humbled by our industry leading custom stained glass process referred to as Scottish Stained Glass. This industry standard for custom stained glass has been a labor of 30 years in the making, providing Fort Worth homes and businesses the opportunity for the highest performing stained glass available in the United States. 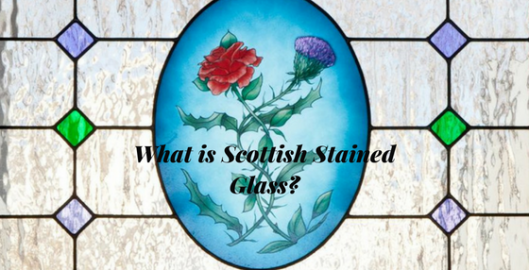 Scottish Stained Glass was developed by our president and founder, Martin Faith.